For every bride and groom who want to give their ceremony new depth and meaning, two noted poet-translators have gathered poems and prose, old and new, religious and nonreligious, that will make any wedding a richer experience. In this wise and delight-filled book, Robert Hass, formerly poet laureate of the United States, and Stephen Mitchell have compiled a collection of poetry and prose that celebrates the mystery of love and the meaning of the marriage pledge. They have discovered some of the most beautiful and profound statements about love and marriage in the prayers and meditations of various cultures — Native American, old Chinese, Buddhist, Hindu, Christian; pieces by Biblical psalmists, Sufi mystics, and Zen sages; traditional European love poetry, and work by modern poets and essayists. 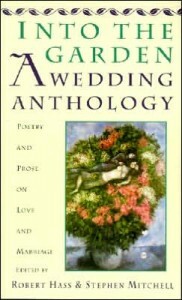 With an introduction by Robert Hass on the wedding ceremony as ritual and celebration, a chapter of longer selections on love and marriage for private reading, a chapter containing examples of wedding ceremonies from various American traditions, and a brief afterword by Stephen Mitchell about marriage as a spiritual practice, this anthology is a lasting treasure for all couples. Déals tríumph and immortal years. And not a wave shall trouble thee. Love is a great thing, a great good in every way; it alone lightens what is heavy, and leads smoothly over all roughness. For it carries a burden without being burdened, and makes every bitter thing sweet and tasty. Love wants to be lifted up, not held back by anything low. Love wants to be free, and far from all worldly desires, so that its inner vision may not be dimmed and good fortune bind it or misfortune cast it down. Nothing is sweeter than love; nothing stronger, nothing higher, nothing wider; nothing happier, nothing fuller, nothing better in heaven and earth; for love is born of God . . .
Love keeps watch and is never unaware, even when it sleeps; tired, it is never exhausted; hindered, it is never defeated; alarmed, it is never afraid; but like a living flame and a burning torch it bursts upward and blazes forth . . . .
Love is quick, sincere, dutiful, joyous, and pleasant; brave, patient, faithful, prudent, serene, and vigorous; and it never seeks itself. For whenever we seek ourselves, we fall away from love. Love is watchful, humble, and upright; not weak, or frivolous, or directed toward vain things; temperate, pure, steady, calm, and alert in all the senses. Love is devoted and thankful to God, always trusting and hoping in him, even when it doesn’t taste his sweetness, for without pain no one can live in love. This has been excerpted from a longer passage; see pages 141-142. In describing the devout Christian’s love of God, it also describes the love of a devoted husband or wife. It might be most fun if this poem is read by members of the wedding party together or in alternating stanzas. For one human being to love another human being: that is perhaps the most difficult task that has been entrusted to us, the ultimate task, the final test and proof, the work for which all other work is merely preparation. Loving does not at first mean merging, surrendering, and uniting with another person—it is a high inducement for the individual to ripen, to become something in himself, to become world, to become world in himself for the sake of another person; it is a great, demanding claim on him, something that chooses him and calls him to vast distances. The passages on this and the next page have been excerpted from a longer statement on love; see pages 151-153. These deeply moving and often prophetic letters were written in 1904 by the poet whom many consider to be the greatest of the twentieth century. Someday there will be girls and women whose name will no longer mean the mere opposite of the male, but something in itself, something that makes one think not of any complement, but only of life and reality: the female human being. This advance will transform the love experience, which is now filled with error, will change it from the ground up, and reshape it into a relationship that is meant to be between one human being and another, no longer one that flows from man to woman. And this more human love (which will fulfill itself with infinite consideration and gentleness, and kindness and clarity in binding and releasing) will resemble what we are now preparing painfully and with great struggle: the love that consists in this: that two solitudes protect and border and greet each other. The first sentence in this selection, because it was written so long ago, may need revising when it is read aloud. You can say, “Now there are girls and women…” and change the tenses throughout. flung onto the wind like doves. as if we gave ourselves as gifts.